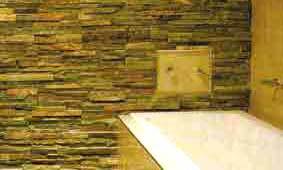 Other than plaster, wallpaper and fabric, wall decor with stones can also give textures and add an ‘unfinished’ look to the room. This can be done by stripping off existing finishes or leaving walls in what might otherwise be considered ‘de-constructed’. Areas of brickwork or stone can be sandblasted and sealed to expose the character and texture of the raw material. Lastly, you can hire a builder to customise one, as shown in the example below. The wall is constructed from brick and is based on an Asian motif. 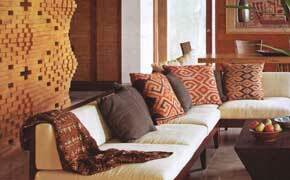 Stone-clad walls are making a come-back but instead of a single texture, marry varied textures. One way is the combination of polished, rough and grooved granite. In the example below, the grains of a pebblewash finish contrast with the smooth bathroom surfaces to add unusual definition to the room. For a luxurious take on stone, consider using onxy. The picture below shows how the dining can become a fine affair against the backdrop of a stunning illuminated onyx divider. 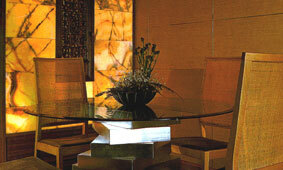 The dining table top stands on a custom-made silver-leafed pedestal that looks almost sculptural. To get a similar look for less, consider using a textured wall covering or laminate. Formica and Tak have exciting new laminate ranges that mimic realistically the tones and grains of materials as diverse as leather, metal and stone. You may not get the three-dimensional look of real stone, but the cost savings will be considerable. Laminates are also easy to care for - they can withstand water and heat, and can be wiped easily. Take a look at wall decor ideas for more contemporary wall decor tips or click on highlighted text to return to the top of wall decor with stones.